•8:15 p.m.: Charlotte Symphony Orchestra, Celebrate America! 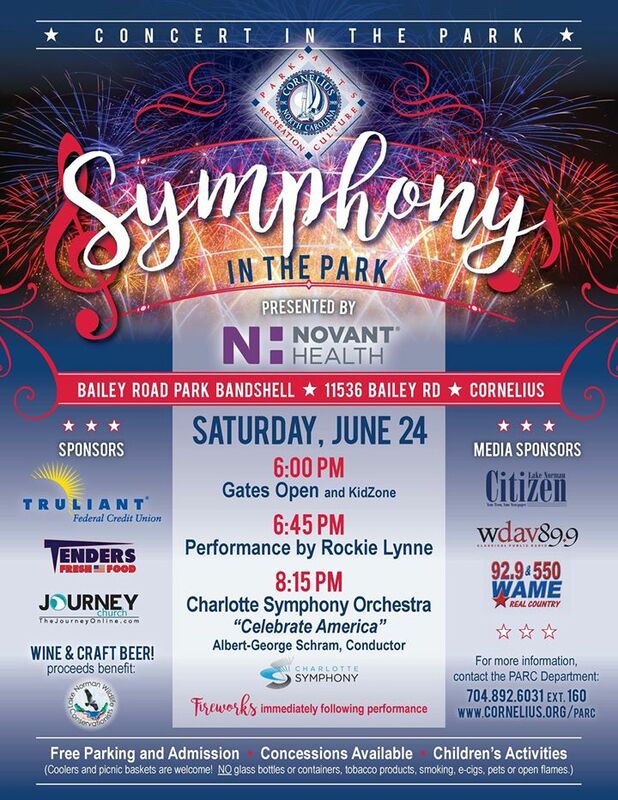 Bring your blankets and chairs and join us for an evening with the Charlotte Symphony Orchestra at the Bailey Road Park Bandshell. The free KidZone will be open from 6 - 8 p.m. Concessions will be available for purchase throughout the evening. Wine and craft beer proceeds benefit Lake Norman Wildlife Conservationists. Coolers and picnic baskets are welcome! NO glass bottles or containers, tobacco products, smoking, e-cigs, pets or open flames.